The Blue Apron IPO has been a disaster. Jana Partners, the activist investor that just made a cool $300 million from its successful Whole Foods Inc. (WFM campaign that resulted in the upscale grocer's sale to Amazon.com Inc. (AMZN - Get Report) , on Monday unveiled another morsel, taking a 2% stake in meal-kit delivery firm Blue Apron Holdings Inc. (APRN - Get Report) . Jana, run by Barry Rosenstein, detailed several other new stakes as well as changes to previously held positions, liquidating some and adding to or subtracting from, other positions. 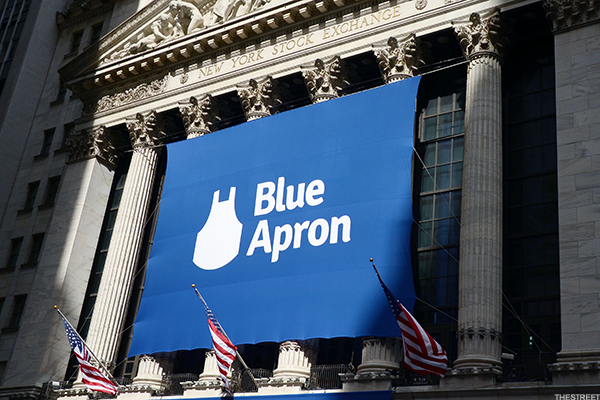 While activist positions are common among troubled firms, Blue Apron could pose a problem for Jana that's likely to draw more attention than most given the firm's capital structure. The company sought to protect itself from a potential onslaught of activist hedge fund managers by issuing three classes of shares in its IPO last month, including one that gives its CEO and insiders stakes with ten votes per share. James Chadwick, a portfolio manager at activist fund Ancora Advisors, suggested last month that some investors may choose not to invest in a particular company if they know that it won't be included in an important index. "Some investors will think that this is going to impact the long-term liquidity and overall valuation of a particular company because you are shrinking your buyer universe," he said. Ken Bertsch, chief of the Council of Institutional Investors, noted to TheStreet's sister publication The Deal in July that there are 30 million votes with Class A shares and about 1.6 billion votes attached to insider Class B shares, based on the 157 million Class B shares outstanding as of May 31. As a result, shares with one vote per share account for less than 2% of the voting float. That's far below the 5% threshold in the FTSE Russell proposal. It's possible that Blue Apron could issue more Class A shares to the public and that could get them past the necessary threshold. However, a requirement that 25% of votes be in public hands would be a much more difficult minimum to get over. As Blue Apron Holdings Inc. trades about 50% below its $10 late-June IPO price following a dispiriting Q2 report, the online meal-delivery provider is facing some hard questions about how much damage the company's attempts to get its sizable losses in check will do to its top line. And these issues, in turn, are tied to what's arguably a more fundamental question about how large the addressable market is for the kind of service Blue Apron can provide in light of its cost structure. Blue Apron plunged last week after reporting second quarter revenue of $238.1 million (up 18% annually) and a GAAP loss of $0.47 a share. Margin pressure contributed to Blue Apron's larger-than-expected loss. Gross profit margin fell to 31.3% from 36.9% a year ago. So did an 86% increase in product, technology, and G&A expenses to $65.7 million, driven by aggressive hiring and fulfillment center buildouts, and to a lesser extent a $3.6 million increase in depreciation and amortization expenses. Rosenstein also took a stake in, of roughly 593,000 shares of natural foods market Sprouts Farmers Market Inc. (SFM - Get Report) . Eric Jhonsa and Ronald Orol contributed to this report.